Customized translucent plastic magnifying rulers are dual purpose promotional giveaways for kids that will bring great exposure at lowest investment. 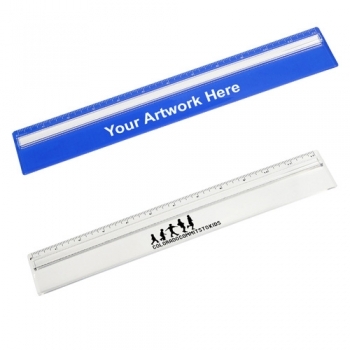 Featuring ruler and a magnifier, these promotional plastic rulers measure 12 3/8"L x 2"W x 1/4"H and can be imprinted with your brand logo or message to advertise your business. These translucent promotional magnifiers can magnify individual lines of text. These promotional rulers are safety tested and not intended for children under three years old. Order today to get started! Request a quote to know savings that you can make on wholesale ordering these promotional translucent plastic magnifying rulers. Product Size: 12-3/8" x 2" x 1/4"
Imprint Area: 3.5" x 0.625"